Summer has begun and kids are families are migrating to the nearest body of water to beat the heat. Whether it’s a pool, ocean, lake or a simple sprinkler, kids love it and get to stay cool and burn off lots of energy at the same time. Because of this, moms are always on the hunt for snacks that are healthy, delicious and easy to pack. And I’m one of those moms 🙂 We went to a friend’s pool this past weekend and while making my mom’s amazing hummus I thought I’d try a different version too, since variety is the spice of life. At least it is in my life! This was a big hit and tasted great on pita wedges as well as celery, carrots and red pepper slices. I love the consistency of it and how easy it is to make. Throw it in a plastic container and you’ve got the perfect poolside/beach snack! Throw all ingredients in a food processor (if using frozen edamame, thaw first). Pulse until mixture is the consistency of guacamole, adding a little bit of water at a time if too thick. Cover and refrigerate until serving. Serve with pita wedges (toasted or not) and raw veggies. 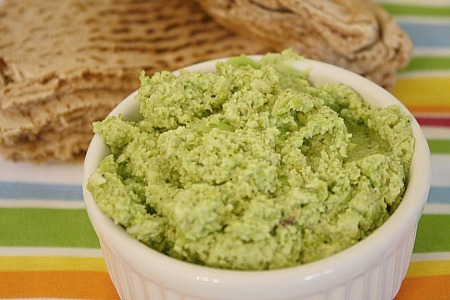 This entry was posted in appetizers, dip, edamame, garlic, lemon, QuickAndEasy, snacks. Bookmark the permalink. 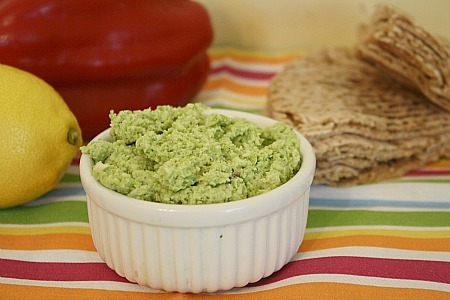 I love finding new versions of hummus and I always seem to have edamame in the freezer! Win. I love edamame-this looks great! I really enjoy making my own hummus but you can never have too many variations! I am always looking for new ways to make hummus! I love the red pepper in this! I love Trader Joe’s edamame hummus and can’t wait to try making my own!